SG Budget Babe: 14% Dividend Darling Stock - A Fairytale or Nightmare? 14% Dividend Darling Stock - A Fairytale or Nightmare? but they don't really have much of a choice but to go along now, do they? In January this year, a 14.3% high-yielding dividend stock caught my eye - Rickmers Maritime. I was tempted to buy it, but decided not to after spending some time studying the company and its business. While the yield was indeed attractive, there were too many red flags that I didn't feel comfortable with. 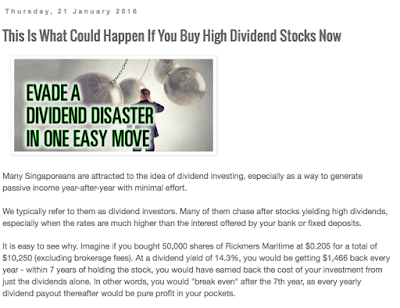 It then inspired me to write down my thoughts in this article, where I specifically explained why I decided to stay away from Rickmers (as well as other high-dividend yielding stocks). Other than looking at dividend yield, we also need to question if the dividend yield is sustainable. 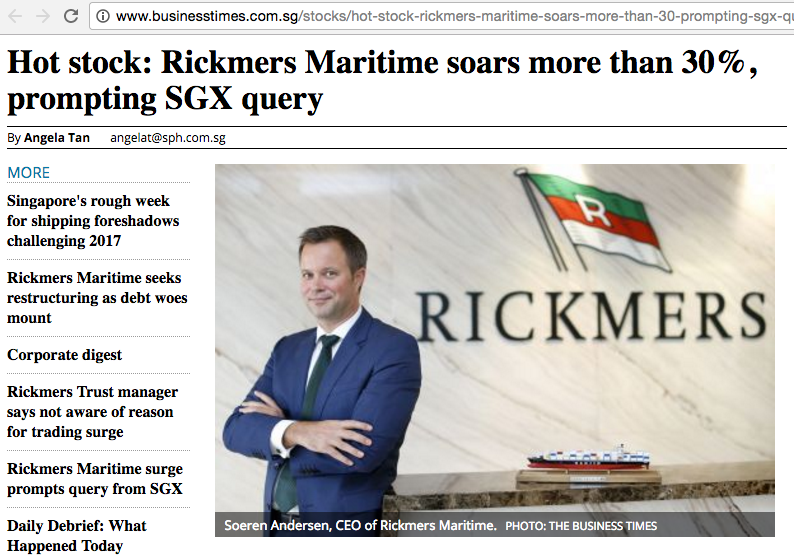 In the case of Rickmers, I highly doubted that they would have enough money to continue such payouts. 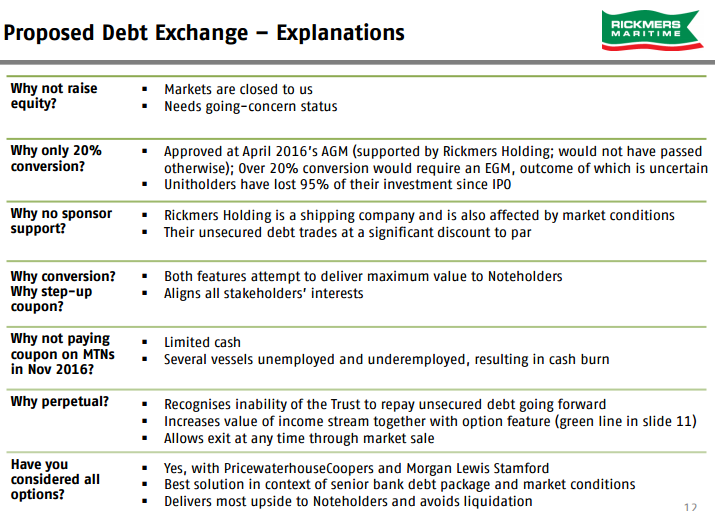 Well, I was proven right when Rickmers suspended dividends shortly after. But in April this year, the stock rebounded spectacularly by 30%, prompting some traders to chase after the attractive profits. Those who weren't lucky enough to get out in time are sitting on 50% losses today. Aside from the shares, there were investors who were similarly lured by high returns and bought Rickmers bonds. Unfortunately, Rickmers has just admitted that they are not able to pay the interest and principal on their US$179 million senior debt due March 2017. Management is now proposing an exchange of the existing principal amount of notes and interest with a NEW unsecured S$28 million fixed rate step-up perpetual convertible securities. Don't worry if you didn't understand that. I didn't catch any ball either. At a minimum of 3.88% and 8.28% returns, this new perpetual convertible securities is more attractive than most saving plans or investment options out there today. I'm waiting to see who else are going to buy into this. Basically, when companies need to borrow money, most would first borrow from the banks. 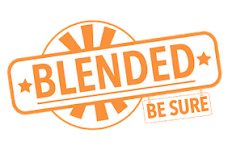 Other ways to raise more money is to issue new shares, bonds, perpetual bonds, convertible bonds, etc. What Rickmers is now proposing is a hybrid security of these. 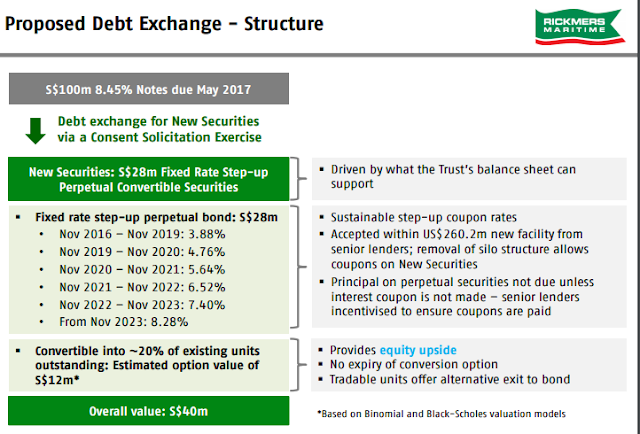 If you're a bond holder, you have two options now - either accept the exchange, or not and watch the company potentially go into liquidation. If the latter happens, you're going to lose your entire capital. What would you choose? 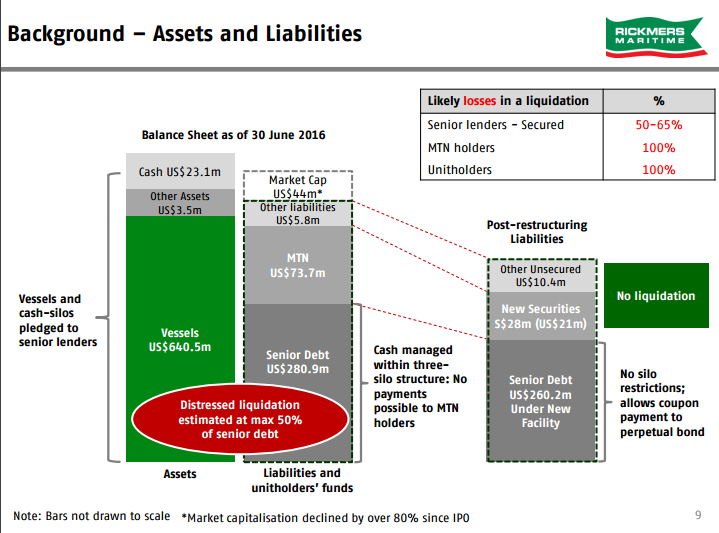 My friend Kyith explained that "in a liquidation, the senior lenders get their first dip on what is left, after selling their assets; then the junior lenders; then the preferential shares holders; then the equities holders". You basically don't really have much of a choice, do you? Now, going by book value, it does seem like Rickmers is under-valued at the moment, as their assets are gauged to be worth almost 10 times of the current stock price. However, this provides a false sense of security. As investors, we need to look into whether these valuations are reliable. Rickmers' ships are valued at their purchase price (at 2006 highs) whereas the same ships are unlikely to fetch the same selling price today. Remember that if you're looking at book value, you should be evaluating based on what the company is worth if you sell off all its assets tomorrow. Imagine if you had bought your condo at the property up-market at $1.5 million, but today in the down-market, buyers are only willing to pay a maximum of $1 million. 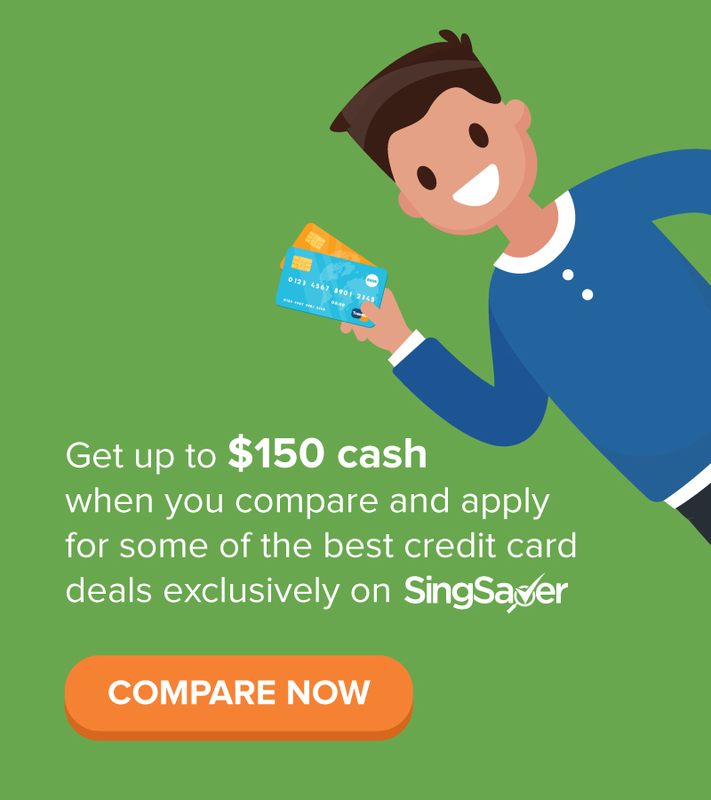 So should your condo be valued at $1.5 million still (your purchase price), or a more depressing $1 million (what you'll fetch if you sell now)? 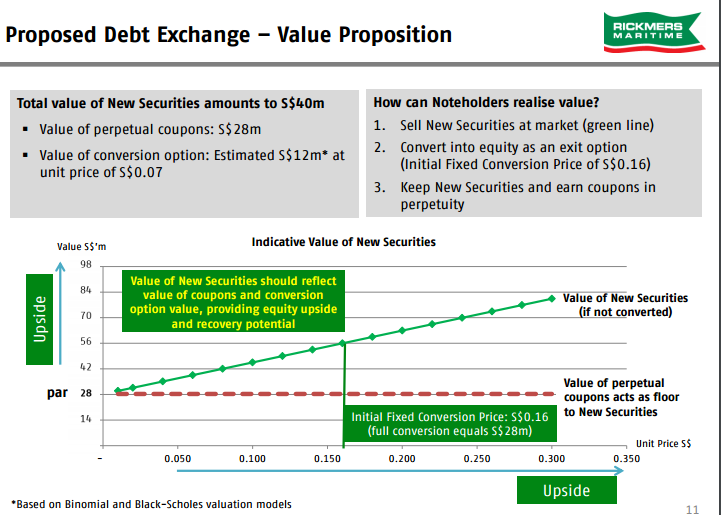 Rickmers is offering new buyers an option to escape - you can convert into shares as an exit option, and they use a target price of $0.16. Today's share price is $0.056. I doubt it will jump by 300%, but I may be wrong. You have to decide for yourself if this target is realistic. 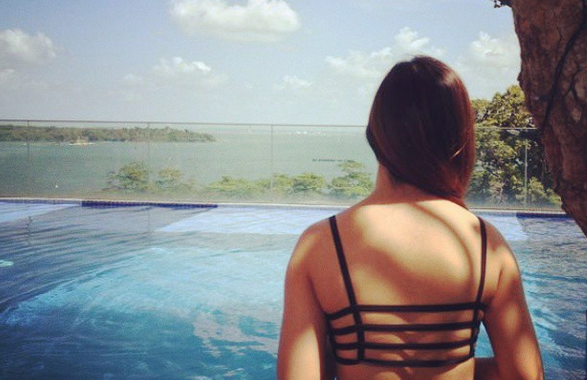 So why is Rickmers doing this? The answer is simple - they have no choice. Take a look at this. Read my friend Kyith's takeaway on this here as well. Some of the images here have been reproduced from his original screenshots with permission. I don't know about you, but I'm sure glad I stayed away from this stock, and will continue to stay away for now. But it'll be interesting to monitor this case moving forward to see what other new lessons we might learn without getting burnt. Great post and good reminder to all of us as dividend or income investors ,,,! I love the analysis and breakdown of the reasons why you were against going into this stock. Great update too! Thank you! I try to keep rational but honestly speaking the insanely high dividend yield was so hard to resist! I'm just really thankful now that I stood my ground and my logical mind prevailed over my greed! With the kind of debt ratio that it has, and a really out-of-norms DPS, I'd say there were enough red flags to caution not to be greedy. My sympathy to those caught in it. I was ALMOST greedy! Luckily my inner voice of reason won the battle. Dividend trap! 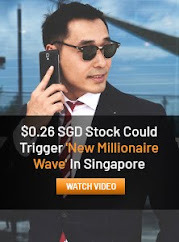 Teaches investors not to buy purely of dividend yield but also check stock fundamentals.